Obama’s get out the vote effort: Why it’s better than Romney’s. 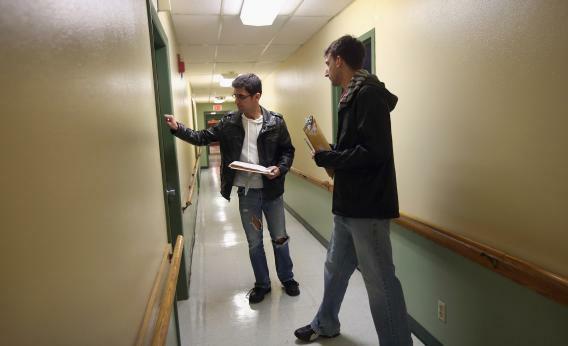 Lots of door-knocking—and years of statistical analysis. CINCINNATI—By the time Mika Darley-Emerson stepped out of the light drizzle and into a doorway’s modest refuge, she’d already forgotten about the instructions she had been given about how to talk to a prospective voter. Four years ago, as she was beginning her first year as a graduate student at the University of Cincinnati, Darley-Emerson had coordinated a system of early-vote shuttles for the Obama campaign. This past Saturday, she returned to the city from the suburbs, where she now has a baby and a partially completed dissertation, to help get out the vote for the president’s re-election. “We go where the volunteers are needed,” the winsome 34-year-old said. Darley-Emerson had a script that was supposed to direct her interactions with voters, but it was buried under the list of names and maps of the middle-class Westwood neighborhood she had been assigned. She’d also received training that morning emphasizing that at the start, volunteers were to find out which candidate the voter supported before moving ahead to other questions. The purpose of a GOTV canvass is to mobilize only those known or highly likely to be supporters. The fourth house Darley-Emerson visited was home to an African-American man in his 30s who came to the door in a sweatshirt emblazoned with the word ETHIOPIA. Darley-Emerson introduced herself, and immediately asked him if he had taken advantage of Ohio’s early-voting window. He explained that he was a nursing student and that a trip to the downtown board of elections wasn’t easy to schedule. Soon Darley-Emerson was talking him through the various transportation possibilities, and the relative merits of garage and street parking. Together they made a plan—he would drive downtown to vote mid-afternoon Sunday—and Darley-Emerson moved to the next item on her mental checklist: pushing this likely voter to move down his ballot to support Ohio’s Democratic senator, Sherrod Brown. Darley-Emerson’s rounds—and those of hundreds of thousands of other canvassers and callers in the closing hours of the election—may look like the basic work of campaigns, the slog of door knocks and repetitive phone calls. But as is the case with much of Obama’s campaign, the dutiful fieldwork is undergirded by sophisticated analytics unmatched by his Republican opponents. The houses on Darley-Emerson’s list were not only likely to contain supporters, but supporters for whom a visit from a canvasser could make all the difference. The challenge for a campaign, of course, is to sort voters into those two categories without the benefit of such visible markers. In an ideal world, a campaign would interview every voter to discern his or her likelihood of casting a ballot and the candidate he or she supports. But no campaign has the money or manpower to track down and survey even a sizeable fraction of the voting public, either through volunteers or paid operations. So campaigns use data about the electorate to increase the quality of their guesses about which voters are likely to have green noses and which ones purple ears. For decades, political targeters had to use geographic or demographic heuristics (classifying precincts based their past vote performance or Census tracts based on their complexion) to sort voters into those categories en masse. With the individual-level voter data and statistical analysis available to today’s campaigns, they can now sort voters one by one. But splitting the electorate into only three or four categories didn’t leave much opportunity to assign priority to individual voters, or room to draw granular distinctions among them. More perilously for Obama, a pure reliance on vote history didn’t help to predict the behavior of young voters, because the campaign simply did not have enough of a track record to assess. The president will rely for his re-election on young people, who overwhelmingly supported him in 2008 but tend to be fickle voters. Which kids had a thin voting history because they only recently became eligible to cast a ballot and which ones because they weren’t the type of people who could be counted on to vote? In late October, or as early as September in early voting states like Ohio, campaigns shift from registering new voters and persuading wavering ones to harvesting votes from people they already count as on their side. Such get-out-the-vote operations include pre-election reminders, providing information on polling-place locations and absentee-ballot protocols, and, increasingly, psychological nudges informed by the behavioral sciences—all delivered over personalized channels like mail, phones, or in-person visits. Indiscriminately subjecting voters who might support your opponent to such motivators is considered an unsustainable risk. As a result, field organizers typically move a voter into a so-called GOTV universe only if he or she has told a caller or canvasser that they are a supporter, or statistical models predict they are likely to go your way. Campaigns tend to focus their mobilization efforts on voters who have been assigned high support and mid-range turnout scores. Those with turnout scores outside a span of, say, 30 to 80 are not worth the effort: Those above it are self-motivated enough to vote already, and those beneath it unlikely to do so under any circumstances. Democrats approach the question of prioritizing voters for turnout in much the same way as Republicans. Obama, however, goes a step farther. Since 2008, Democrats have administered randomized-control experiments to test the impact of GOTV contact on voters with different score combinations, with the goal of quantifying where those contacts are most likely to produce a net vote. The most fruitful terrain turned out to surround voters with turnout scores centered around 45. Delivering a GOTV contact to a voter with a 100 support score and a 45 turnout score increased the likelihood of netting a Democratic vote by 4.5 percent; delivering a GOTV contact to a voter with a 75 support score and a 45 turnout score increased the likelihood of netting a vote by 2.7 percent. Obama’s analytics department synthesized all of this research into a new GOTV score that combines predictions about one’s likelihood of voting and supporting Obama. It, too, ranks voters from zero to 100, but this one doesn’t assess voters’ characteristics so much as prioritize them based on their susceptibility to the campaign’s efforts to modify their behavior. When canvassers like Darley-Emerson get a list of names, it has been edited according to the one criterion that matters: how likely her visit is to generate a new vote towards the president’s re-election—whether the canvasser remembers to ask who the voter is supporting or not.